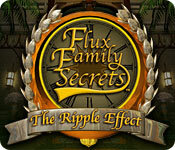 Flux Family Secrets: The Ripple Effect is rated 3.9 out of 5 by 30. Rated 4 out of 5 by pennmom36 from Flux Family Secrets: The Ripple Effect Jessie has been trying for years to piece together her past with nothing more to go on than a baby photo. Out of the blue a woman named Veronica contacts her with the promise of enlightenment of her past, that all will be explained when she arrives at the Flux Family Manor. After a series of tests, Veronica tells Jessie she's a Flux and they travel through space and time collecting fragments that have been torn apart from the constant tug of war, space and time create. The first assignment is to restore art, DaVinci (1518) needs fragments to restore the Mona Lisa, Hatshepsut (1458 B.C) needs fragments to restore a bust of the Queen, and Shakespeare (1616) needs fragments to restore his self portrait. You can choose any artist at any time or even go back and forth. You find several fragmented items hidden throughout each room, once an item has been restored, you will use that restored item within the scene to activate some type of mini game, or reveal the next fragment. There is a Zoom feature magnifying glass that can be accessed for searching up close. There are a lot of Mini Games, some very simple, some lengthy and some frustrating, if you choose to skip any puzzle, there is a 20 minute penalty added to your overall game completion time. Some require you to line up 4 matching symbols once you figure out which symbols are available on all 4 slots, sliding puzzle tiles with one empty space to complete an image, or figuring out a lock combination by slowly turning dial until the light turns green, and, if you rotate the dial too fast you have to start over. This isn't a bad game if you enjoy a lot of mini games and FROG type Hidden Object Scenes, and this is the first game in the Trilogy, enjoy! 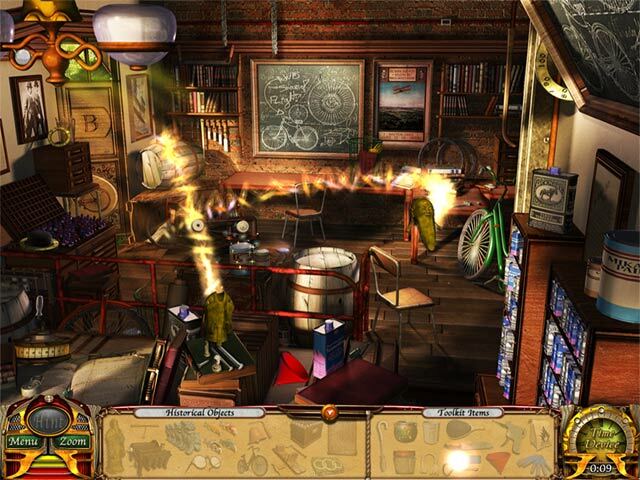 Rated 4 out of 5 by hermitcave from fragmented hidden object game different from traditional HOS games fragmented hidden object game - where you find parts or fragments of objects hidden in the scene, and once combined, are then used in the same scene or another scene to complete a puzzle or placed in specific spots in the scene to finish that part of the game. 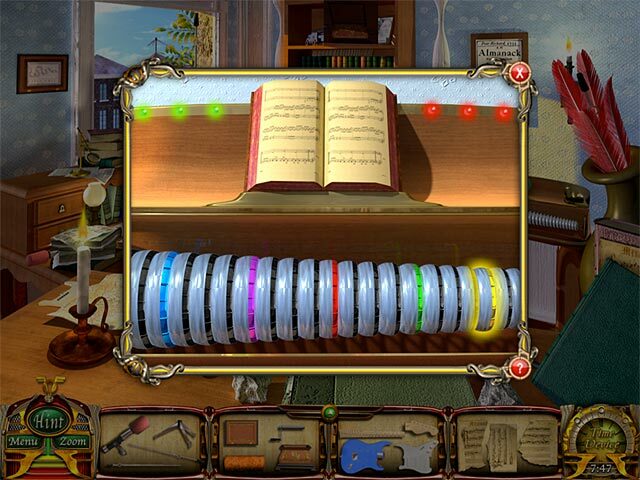 The puzzles and mini games will often reveal a missing fragment needed to complete an object that is then used somewhere in the scene or another scene. This requires you to visit each scene several times to complete the chapter. Then you need to visit each scene (there are 3 scenes in each chapter) to collect 2 specific objects from each scene to finish the chapter. Most fragments are relatively easy to find but some are very well hidden. Fortunately, there is a magnifying glass (rectangular in shape) that can be accessed by right clicking in the scene. It can be very helpful but I found it somewhat tedious running it over the entire scene to find a thin white fragment in a scene full of such things until you happened to find the right one. The story line involved you being contacted by a secret group that time travel to repair and collect items of historical value in various time periods and retun them to their proper place in time. There are some historical facts presented throughout the game that are of educational value so you can learn or be reminded of history while playing the game. Overall, I found the game fun and would recommend it. I plan to play the other 2 in the series. Rated 4 out of 5 by fundit2 from historical errors you must fix I can't decide if I really like this or not. I completed it the first time I played, then got stuck the second time and just quit. The premise is fun - find the items that are in the wrong historical period and fix them. It definitely has a "more to come" cliff hanger at the end, but that didn't bother me. Sometimes it does. It left questions, but not frustration. I liked this better than other flux games - maybe because I played it first. Rated 4 out of 5 by UsernameUnknown from Best of the Flux Much better than the other Family Flux games. Rated 4 out of 5 by neilskinut from true HOG Not a bad game. It is HO and not much for finding clues. Gets a little old for me. Has a good education background. Rated 4 out of 5 by Torpedo1 from Something a Little different Light and breezy game. I liked how it played different then most games, but it did get a little boring, but not enough to keep me from liking this. 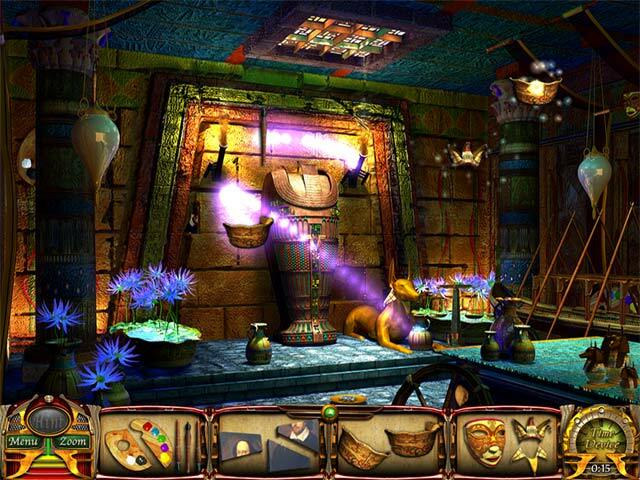 Rated 4 out of 5 by GoGoBlue from Fun Hidden Object Game I enjoyed this game, but it did get a bit repetitive. The game mainly consists of you finding misplaced objects in the past. Scenes were revisited several times, but from different view points. I found it not all that challenging, but definitely still fun to play. The graphics are nice, but you must read everything the character's say. The background music is pleasant though! It's a game worth getting. There's a sequel, which I have bought and am about to play. Rated 4 out of 5 by DrunkArmadillo from Historically Interesting The game has a nice approach. There are a few puzzles but its mostly HO. There is 10 levels for which you have different type of History theme. ( Music,Flight,ect.) The levels aren't too hard and you can complete in total 4-5 hours, less if you are really good or use a lot hints. The hints are endless for each level you just have to wait for the bar to be full which makes it less changeling. It nothing extreme special but if your looking for a entreating HO game to sit back and play. Rated 4 out of 5 by zorabelle from Pretty Good Although this game is not like the newer games of today,it was not too bad.The visuals were good and colorful.The game takes you back in time to visit several locations to find what I call fragmented pieces of hidden objects.You visit the same locations to find different items.The music is good but it is a slow paced game and one in which you will finish all to soon. Rated 4 out of 5 by itsme4t3 from All HO There are small puzzles, but for the most part this is a HO game. Once I got going on it, I liked it more than I thought I would. I don't have volume on so I don't know about the sound. The zoom feature makes the searching so much better than most games. Rated 3 out of 5 by megwoman25 from Great time killer I realized recently, I had bought the 2nd in this series and not the first so I am getting myself caught up so I can play the 3rd. I very much enjoyed this game. I liked going to the different worlds and learning historical facts about different items. I liked the noises the objects made when clicked and I liked the overall finding of the Fragments but also later finding a list of things. The mini games were unique and some hard to figure out but always manageable. I didn't like having to do some of the puzzles over however. The lock and pipe puzzles kept reappearing but weren't too difficult. The skip and hint buttons charge fast but there is no choice of difficulty as there usually wasn't back when this game was released. It was a great game in the year it was released however comparing to modern day games, its not the best. Although I found the different worlds a great idea, the people kept repeating over and over, same with their worlds. Its as if we saw their world from another angle like the room next to the previous and so on. The plot was a little strange, it definitely explains things better in the 2nd one. Overall, this was a fun game and I recommend it especially if trying to follow along with this series as its quite good or just to kill time, this one is good. It took me about 3-4 hours to play this game. The fragments are not the easiest to find within the scenes so it took me awhile. My only huge pet peeve would be the final puzzle because it is not skippable and its putting the items you find with the right people. My memory is kind of bad so I had a hard time trying to figure this out and whats worst of all, the ones you have right, don't stay put so once the game resets you have to put them in all over again. I would have liked it better if the ones I got right stayed put. Made it tedious and the reason I gave it only 3 stars. Rated 3 out of 5 by denniann2 from gtot tiring sas i continued playing a good game, with crisp graphics. the mini games were, for me, kind of challenging. it had most of the ones i usually can't figure out. had to skip most of them. may be because i was getting tired of the game and didn't want to put in the effort. the end is set for a sequel. i have played the other ones, and i don't think i will any play anymore. try the demo and if you enjoy it, you will probably like the game. the whole game is like the first part. hints and skip buttons recharge really fast. Rated 3 out of 5 by Melvin2 from OK, but no cigar I liked this game at the beginning, but I thought it got boring as I went along. The graphics were ok, but lost crispness on the zoom. I am still playing it through, but only do one dimension a day just because I get tired of it. Rated 2 out of 5 by Dr_Q from Decent storyline doesn't compensate for boring play It's a fragmented object game, not a hidden object game, so if you like FOGs, then go for it. Otherwise, give it a miss. Rated 2 out of 5 by scarreddarling from Couldn't finish Too simple and totally boring. Rated 2 out of 5 by godfreygirl from I so wanted to like this game!! I was excited to try the trial after reading the great reviews, but maybe I'm not as keen of eye as some others. I had a very hard time and really just didn't get it much. I didn't like having to find parts of objects...some hidden VERY well....and found myself using the hint button over and over. You have to find parts of objects in the room, then put them in their proper place when all parts are found. There are some mini games, but I didn't know until they were there that a part I'd been trying to find was in the puzzle when finished. I just didn't like the game much at all. I didn't even get through maybe 15 or 20 minutes of the game before I just gave up and deleted it. Sorry, I just didn't get the fun factor in this one. I really wanted to.....the graphics were beautiful. Rated 2 out of 5 by hunter1895 from Boring I got really bored with this game, it was too repetitive. I finished because I like to finish the games, but it took me a while since I would only play for a little while and then play something else.I did not listen to the sound. I prefer the HO adventure games. Rated 1 out of 5 by Gamer92 from Boring I liked the other Flux games but this was just plain boring. Same thing over and over.